Powers/Abilities: Thanatos possessed the Destiny Force, making him immensely powerful, although he was never shown to utilize it in the same way our Rick Jones had. He possessed an unknown degree of superhuman strength and reflexes, (Class 10? Class 100?). He could fire eyebeams, and could survive the discorporation of his body. He was the master of Innerspace, his "place of power" and had almost complete control over it when inside. He was able to manipulate Spider-Man 2099's perceptions of reality while they were there, and grow to giant size, holding the future Spidey in one hand, when they fought. Thanatos also claimed that he was "strongest during night," but this was left unexplained. He wielded the Spear of Destiny, a phenomenally powerful artifact and also utilized a blaster gun. He also had a hover-ship, which he used for transportation in the future of 2099. History: Thanatos-Rick Jones' life is the same as the Earth-616 Rick Jones' up until a point during the Kree-Skrull War (Avengers I#97). He grew up in an orphanage, accidently "helped" create the Hulk, and was semi-responsible for the formation of the Avengers. (Captain Marvel V#30 (fb))- After the Kree-Skrull war in his reality, Rick Jones chose to stay with the Supreme Intelligence on Kree-Lar, despite Captain America's protests. After learning all he could from the Kree leader, Jones slew him. BTS- After killing the Supreme Intelligence, Thanatos came up with the idea of becoming the definitive Rick Jones. He then traveled through alternate realities, claiming that he "destroyed several worlds and at least one universe, [and] caused a few crises." It is probable in these journeys that Thanatos took part in the so-called "Eon War," the conflict that erased the heroes prior to the 2099 timeline and killed the Thor of an alternate reality, as the Net Prophet hinted at. He may also have ventured to the New Universe. At some point, possibly during the Eon War, his body became discorporated in the 2099 timeline. (Spider-Man 2099#11)- Thanatos aided Spider-Man (Miguel O'Hara), against agents of Alchemax, wearing S.I.E.G.E. gear (SItuational Emergency GEar), by slaying one who had captured Spider-Man, enabling O'Hara to escape. Spider-Man barely saw Thanatos' hover-ship flying off. 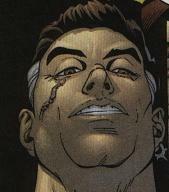 (Spider-Man 2099#12)- Thanatos attacked Tyler Stone, taking him hostage along with O'Hara as Spider-Man. (The latter in exchange for O'Hara's girlfriend, Dana.) He then demanded to be taken to Alchemax's Virtual Unreality project. Once there, Thanatos threw Jordan Boone into the Virtual Reality portal and when the Alchemax employee was fished out by Spider-Man, the Net Prophet appeared from the portal. (Spider-Man 2099#13)- Thanatos confronted the Net Prophet, both admitting to have some knowledge of each other, and, after a skirmish with Spider-Man, badly speared the prophet. Thanatos and Spider-Man were then both blown into the virtual unreality portal by Alchemax security guards armed with futuristic bazookas. Inside Thanatos absorbed massive amounts of power, growing in size, while Spider-Man had bizarre visions. Thanatos grabbed Spider-Man with one hand and was crushing him when Spidey, having venomous fangs, bit his hand. This caused Thanatos to release the hero, who saw the Net Prophet's arm coming through a portal, which he was pulled through to safety. (Spider-Man 2099#14 (fb))- Thanatos tried to escape Innerspace and return to 2099 via the virtual unreality project. His massive face appeared upon the portal and a large arm started to come out of it when Jordan Boone cut the power. The face, which had been laughing, screamed and disappered, while the arm fell to the ground, carbonized. (Captain Marvel V#27)- Thanatos appeared on planet Vargas in the Tau Ceti system where the Titanian Eternal Starfox was having a rendevous with a lover. Thanatos killed her, and impaled Starfox on his throat with the Spear of Destiny. While mortally wounding Eros, Thanatos inserted chronoparticles into the wound keeping it temporally inert. Thanatos forced Starfox to seek out Captain Marvel/Rick Jones and to bring them to the Virtual Unreality project at Alchemax in the 2099 timeline. When he had completed this, Thanatos promised to restore him. (Captain Marvel V#28)- Thanatos broke out of the Virtual Unreality project at Alchemax in the year 2099. He threatened Jordan Boone and Tyler Stone, while awaiting the arrival of his pawns. (Captain Marvel V#29)- Once Spider-Man 2099, Starfox and Captain Marvel all arrived at the VU project, Thanatos forced their entry into it and himself went to Innerspace. There he used Innerspace's power to transport Captain Marvel, Spider-Man 2099, and Starfox to the Maestro's palace in an alternate reality, while he and Rick Jones encountered the aged Rick Jones of that timeline. Due to Innerspace's nature as a "nexus of realities," Captain Marvel and Jones could exist in the same dimension seperately. Thanatos then revealed himself to be an alternate reality version of Jones. (Captain Marvel V#30)- While Spidey and Captain Marvel kept the Maestro busy, Starfox was forced by Thantos to retreive Dr. Strange's cloak of levitation and Amulet of Agamatto. Meanwhile, Thanatos revealed his plan to the other Rick Joneses. After Starfox retreived the items, he was teleported, by Thanatos, to the villain. Starfox and the mainstream reality Jones attempted to stop Thanatos, to no avail. Thanatos united the power of Dr. Strange's cloak, Dr. Doom's time platform, Thor's hammer, the Amulet of Agamotto, and the Spear of Destiny. Captain Marvel finally arrived and Thanatos threw the spear at Starfox's head. Rick and Captain Marvel jumped in the way, becoming imapled together. Just then, however, the elder Rick Jones summoned Mjolnir, using it's "secret name" to call it and being worthy to hold it for "stuff that you ain't done yet, Rick-O ... and you, helmet head [Thanatos] you ain't never gonna do." Combining Mjolnir and the Nega Bands weilded by Marvel and the young Jones, Thanatos was turned into a ... brick. ("Hit the bricks" being what the old Jones said when the energies were combined.) The energy also re-fused Captain Marvel and the young Rick Jones, unharmed from the spear and sent both Starfox and Spider-Man back to where they belonged, prior to their leaving. This meant that while he retained the memories of the events, neither Starfox or his alien lover encountered Thanatos on Vargas. Comments: Created by Peter David and Rick Leonardi. Special thanks to Gary M. Miller for the information on the Net Prophet and for helping to piece together Thanatos' history. 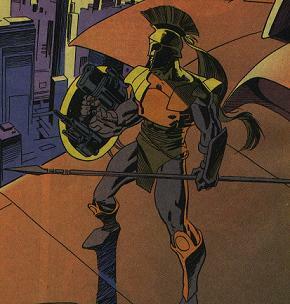 According to Peter David, the identity of Thanatos was the second-most-asked question of him by fans. (No idea what the first is.) Also, he stated on the Captain Marvel message board that Thanatos being Rick Jones was "one of several possibilities I had in my head when I created the character. Because of the series in which I finally got around to doing the reveal, I went with what I did for obvious reasons." I wonder who the other possibilites were? Thanatos' goals changed greatly from Spider-Man 2099#13 ("Devastate [the] world of 2099) to Captain Marvel V#30 ("I will be the ULTIMATE Rick Jones") I assume this is related to the fact that the ID was revealed in Captain Marvel and not a 2099 book. Personally, I liked him better in the Spider-Man appearances; he became kind of silly once his ID was revealed. The choice of the "objects of power" seem a little odd and "rushed." The Spear of Destiny is fine, as is Dr. Dooms's time platform, but having both Dr. Strange's cloak and Amulet of Agamotto in addition to Thor's hammer, Mjolnir, seems to me to have been done merely so the "Future Imperfect" timeline could be traveled to. 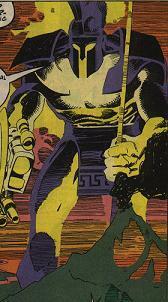 Thanatos encountered Justice and travelled to the New Universe either prior to the Starblast crossover or in the future when the Living Tribunal's seal is taken off. Either way, the seal has to be taken off (By the Tribunal, since no one is more powerful) at some point in the future to allow Justice's travels through time and space. Perhaps it was during the so-called "Eon War" that the two characters first met. The events that take place in the Future Imperfect timeline occur prior to Incredible Hulk: Future Imperfect#1. The events in the 2099 timeline are harder to place. Peter David has stated (On the 2099 Underground message board) that he put the 2099 parts of the story around Spider-Man 2099#22 (after Gabriel O'Hara found out Miguel, his brother, was Spider-Man, but before Miguel found out Tyler Stone was his real father.) However, Jordan Boone is portrayed as a normal Alchemax employee, while he was turned into "Loki" (and later became Halloween Jack) by the Alchemax Aesir project in the "Fall of the Hammer" 2099 crossover, of which Spider-Man 2099#16 was part 1. I would therefore say that Jordan Boone/Loki/Halloween Jack used his shapeshifting powers to portray himself as Boone at Alchemax for some reason of his own during the time the 2099 segemnts occurred in Captain Marvel V#28-29. I assume Mjolnir's "secret name" is the same name Thor called in Avengers Annual 19 to make Mjolnir (inside Terminus) come to him in space. The "Ultimate Rick Jones" idea is most certainly Peter David's dig at Marvel's current Ultimate line of books. The Spear of Destiny held by Thanatos may or may not be the alternate dimensional counterpart of the one from Earth-616. 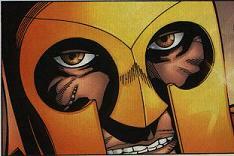 The Spear of Destiny of Earth-616 is seen in Wolverine: Evilution. A Spear of Destiny is also seen in the Ultraverse, in Mantra: Spear of Destiny#1. Thanatos has an entry in OHotMU 2006 A-Z#11. The Spear of Destiny, is the actual spear used by the Roman Centurion to pierce Christ's side during the Crucifixion. According to legend, whomsoever held it controlled the fate of the world. Stories tell of Adolf Hitler's seeking it during the second World War to ensure the victory of the Third Reich. How Thanatos came to possess it was never revealed. Thanatos' hover-ship was his principle mode of transportation in the New York City of 2099 AD, (That's Anno Domini, not After Doom.) and bore the Greek letter "omega" on its hull. It was a very fast flying vehicle, which passengers rode on top, apparently not having an inside to ride in. Thanatos used this vehicle to take Tyler Stone to Alchemax for ransom.